A Cheap Electric Toothbrush - Which is the Best? A cheap electric toothbrush can sound enticing, but you don't want to go TOO cheap! As with everything else in life, you tend to get what you pay for. When you look at the lower price level electric toothbrushes, they will be much simpler than the expensive ones, which is fine. But if you go too cheap, you may run into problems with reliability, and the actual brush will not work well at getting your teeth clean. In addition, the really cheap electric brushes will have a short lifespan, maybe only a few months! So the trick is to find a reasonably-priced toothbrush that is still well-made and reliable. Electric toothbrushes at the lower end of the price scale will typically only have one "program", which is on or off. They do not have a choice of speeds. For most people, this will not be a problem. Also, they will have less in the box to start with. Where a more expensive brush might come with 3 or 4 brush heads, the cheaper brush will have just the 1, or maybe 2 heads. Another difference will be the power source. Nearly all electric toothbrushes are rechargeable. They come with a stand or a docking station that you put the brush onto, and it recharges the battery inside the brush handle. More expensive toothbrushes will have a bigger capacity battery that lasts longer between charges.This feature alone might sway you to look a little higher than the bargain-basement cheap electric toothbrush! On the other hand, lower-priced brushes have smaller batteries with lower capacity, and will need to be recharged more often. This is not such a big deal, because you can just use the charging unit as a "docking station", and park your brush there whenever you're not using it. However, there is also the problem of how many charging cycles a battery can take. The less expensive batteries will lose the ability to "hold a charge" much sooner than a more expensive battery. Again, you get what you pay for! There ARE a couple of brushes available that take normal (non-rechargeable) batteries. When the charge runs out, you have to replace the batteries with new ones. These are usually AA size. A good example of this type of brush is the Sonicare Powerup toothbrush. However, it's worth remembering that over a period of time, you could end up spending more on batteries than the actual brush! Don't forget, you don't have to buy a full electric toothbrush kit for each member of your family. The brush heads on nearly all modern brushes are quick and easy to change. This means that you only need the ONE electric toothbrush handle, and you can have a separate brush head for each member of the family! The best cheap electric toothbrush at the $25 level is probably the Oral B Vitality. This is a rechargeable brush that comes with a charger that you can leave the brush on, and an additional brush head. It costs around $25 approximately. In the box, there are little colored plastic rings that you can put on each brush head. This way, you have a different colored ring to identify which brush head belongs to which family member. Another good budget electric toothbrush with a rechargeable battery is the Phillips Sonicare Essence. This is a bit more expensive than the Oral B Vitality, and has a different feel in your hand and also on your teeth. Also, it is quieter than the the Oral B model. Slightly more expensive again, at around the $50 level (WITH MY SPECIAL DISCOUNT CODE) but a great choice (if is the Amden Cybersonic3 (read a review of this toothbrush). Although it is normally priced at just under $100, it is frequently available on the company website for under $50, with my special discount code. At that price, it is a bargain! I REALLY like the Cybersonic3. Go to the review page link above to find out more about this brush, and to get the special discount code and link to the Amden sales page! So the best cheap electric toothbrush depends a bit on what price you can find for any of the brushes mentioned on this page. 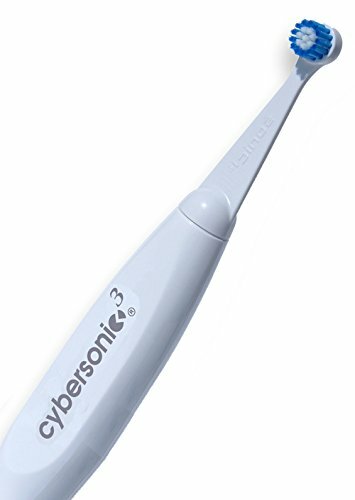 If you can get the Cybersonic3 sonic brush for around $50, it is definitely the best deal at that price level. I recommend the Cybersonic3 to all my patients. If you can stretch to about $50, then this brush is amazing value for the performance - IF YOU USE MY SPECIAL DISCOUNT CODE!. Click here to learn more about this toothbrush, and to get the discount code!